This week we look back to June 1989 when Rt Rev Robin Eames, the Archbishop of Armagh, officially opened the new Derryloran Parish Hall. 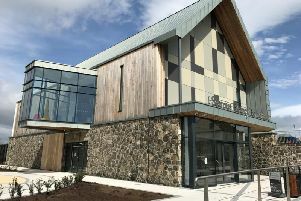 The hall was designed and refurbished at a cost of £80,000. Chairman of the Parish Stewardship Committee, Wilfred Young, spoke at the official opening and outlined the four years refurbishment progamme. He said the main hall had been completely refurbished and a new entrance hall, committee room and parish hall had been added.